If you're looking to make a donation to a charity, one of the biggest factors is finding out how that organization spends its money. Charity Navigator is a huge help for those looking to donate to larger, more mainstream organizations. But if you want to help horses or have a horse who needs a home, where do you look? And how do you know if an organization is legitimate? Answer: look at organizations who are accredited by the Thoroughbred Aftercare Alliance and are grant recipients from Thoroughbred Charities of America. Both organizations, although slightly different in their missions—TCA grants money, while TAA grants funds and gives accreditation—have lengthy application processes that require disclosure of everything from equine inventories and employees to spending and adoption policies. The application process isn't easy and it's not forever; an organization must reapply every year for a TCA grant, and TAA accreditations only last two years. However difficult it is, organizations say it's worth it, both from a financial standpoint and from being vetted by a third-party. "I've heard from organizations that if they are approved for a TCA grant that they feel it is a seal of approval because our grant application review and selection process is very detailed and extensive," said Erin Crady, executive director of the TCA. "We spend hours reviewing grant applications to ensure the best use of those available funds." In addition to funding, knowing an organization is certified brings peace of mind to those who are looking to retire horses from the track. "Money is important, but the best thing that they've done is this (TAA) accreditation," said Michael Blowen, founder of Old Friends Thoroughbred Retirement Farm, who said his organization's IRS audit was nothing compared to the applications. "We get calls all the time about taking horses and if we don't have room I need to send them someplace...now all I have to do is tell them to call the TAA, because I know all the places that are accredited by the TAA are legitimate," he said. "If they've gone through the same process we have and if they can pass, I don't have to worry about the horse. That's a huge relief." 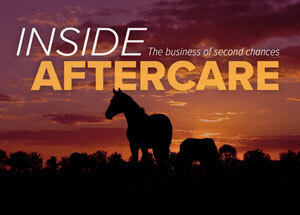 TAA's Stacie Clark said this review of organizations acts as a check on the racing and aftercare industry. "You want to make sure horses come out of horse racing into a next best step," she said. "If we weren't out there doing inspections, or we didn't get their applications, or know their financial status, we couldn't do that. This helps us get the first step...we can say in good consciousness that we did take care of the horses we brought into the racing game."